I heard this top coat is comparable to my beloved Seche Vite so I had to try it out. It was a real pain to find but I finally came across it at Target. I don't remember the exact price but I know it was somewhere in the $3-$5 range. Since that's half the cost of Seche Vite I figured I would give it a try. I love Seche Vite because it dries quickly and leaves my nails with a mirror like shine. It's the top coat I compare all top coats to. The consistency of this Sally Hansen top coat is slightly thinner than Seche which makes it a bit easier to work with. Still, I've heard this top coat gets goopy and thick halfway through the bottle just as all quick dry top coats do - invest in some Seche Restore, guys. Yes, it's not just you and it happens to everyone and the only way to combat it is thinner. Another bonus is that this dries just as quickly as Seche Vite. 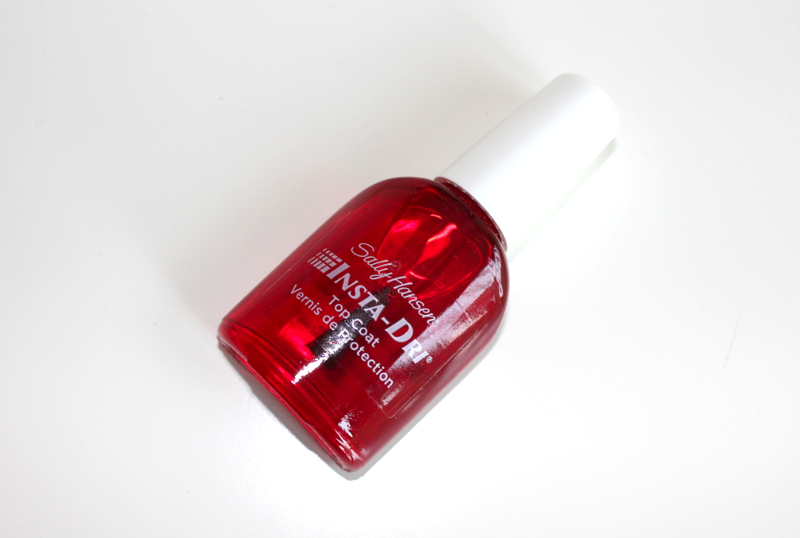 Once you try quick dry top coats you'll probably never be able to put anything else on your nails again. You're telling me some people choose to sit around with their nails wet to the touch for longer than a minute? Don't waste my time. The finish on this is shiny but it's just not up to par for me. It gives your nails a finished look and a nice glossiness but it's just not quite the mirror like shine of Seche Vite. I need to be able to see my reflection in my nails - give me glossiness or give me death. If you don't feel as strongly as I do about the reflective powers of your fingernails, this might be the top coat for you. It's a save compared to Seche Vite and you still get the quick dry time - just not the finish I would consider perfect.